Heavenly blog! : No. 1013: The false apostle and fool tag Jan Aage Torp alleges he gets letters and it is sent fictitious letters in his name even though he has filed a fictitious review! No. 1013: The false apostle and fool tag Jan Aage Torp alleges he gets letters and it is sent fictitious letters in his name even though he has filed a fictitious review! The false apostle and fool tag Jan Aage Torp alleges he gets letters and it is sent fictitious letters in his name even though he has filed a fictitious review! 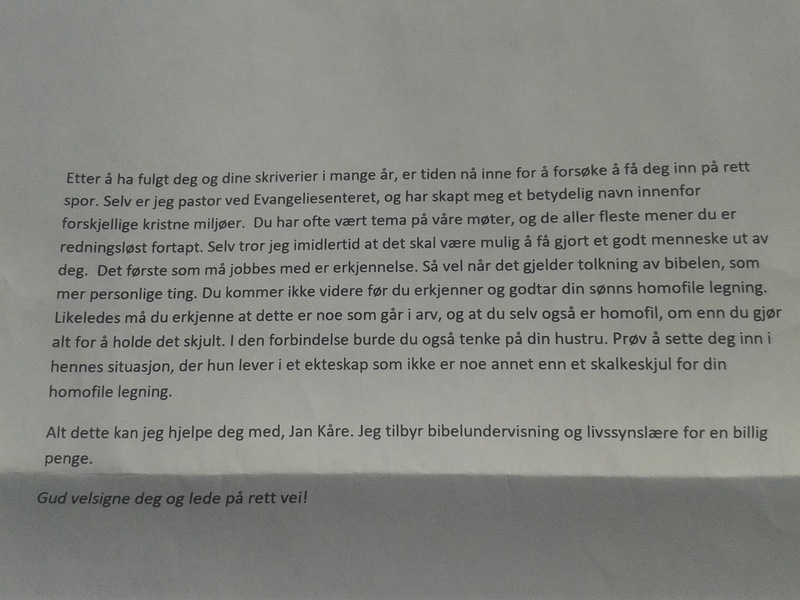 I got this letter that it is very possible that it is Jan Aage Torp behind when it seethes and boils with hate against the homosekuelle which is his foremost area to attack, besides me as a true witness of the Lord! Who stands behind what here? The police do nothing, they stay with fun tag and the false apostle January Aage Torp, totally sick is what hatred police Manglerud doing! They are obvious not fit for the job! The principal is Torp. No other! But the same sick Spirit who dwells in him, the lives of all the others! Therefore, it is January Aage Torp who have staged, spread and are the real criminals here. The other is a bar offshoots of him, be sure you! They are like mushrooms of Torp. Stories about torturing camp activities in Christian auspices of the past, says Andreas Hegertun. He reads with grief Anders Torp their experiences. Aftenposten and A magazine had the Friday large spread to the son of pastor Jan-Aage Torp in Oslo Church, Anders Torp. Anders has left his father's church, is declared atheist and very critical to the business he like children and youth participated in the Christian auspices. He has told his story, most recently in a new edition of Levi Fragell book "We who loved Jesus." Anders Torp tells how he was only 13. fasted for 40 days, which made him terribly thin and poor. He also tells of a camp in Denmark under the auspices of the church Father's house, where the participants were to experience what it was like to live under oppressive regimes. They should be drilled to not renounce their faith. Drill No consisted of punches and kicks, being held under water so you believed drowned, being shoved sand down their throats and make fake identity cards. Anders Torp says he repeatedly thought he would die. The book tells the Torp that exorcism was naturally part of the activity in the communities he grew up in. He was also prone to this even when he was a teenager. In all, 17 expulsions were carried out on him shortly. Anders Torp says further about a childhood marked by the fear of hell and damnation, of a constant fear of sin, not to witness enough for the body and sexuality. Oslokirken has loosely been linked to the Pentecostal movement in Norway. Pastor in Filadelfia in Oslo, Andreas Hegertun, knows Anders Torp well, he knows his history. - I have a burning desire to be absolutely clear that this Anders tells about is the extreme environments that have nothing with the Pentecostal Charismatic I know. Jan-Aage Torp is entirely on the fringes of church countryside, he said. - I read with sorrow Anders their experiences. He had every right to react. No one shall be subjected to such. Hegertun adding that he is glad that today there are very few who experience such things as Anders Torp experienced. - It does not reflect the reality Christian youths face today. It has not been possible day to make contact with Jan-Aage Torp. On his blog, pastor that he as a father "has obviously made many mistakes, but that Anders and I were fond of each other as father and son." 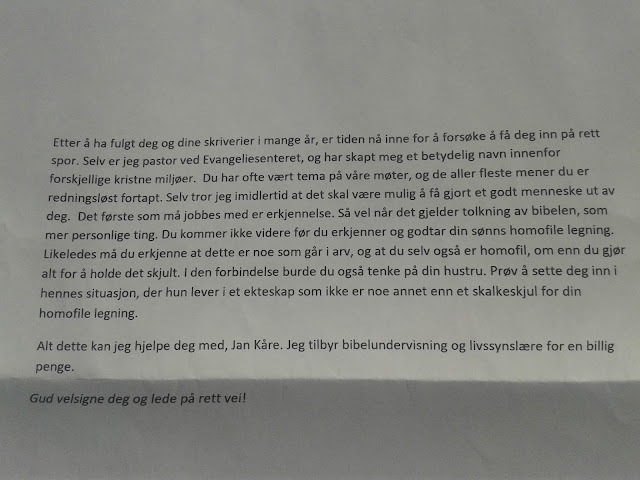 The pastor believes the matter in Aftenposten is based interview. - Aftenposten wrote without checking their sources. Unfortunately much free poetry that should be reviewed. Press Council (PFU) is an important task, he writes. - Aftenposten today, and in 2009 VG, has received its convenient lookup. And Levi Fragell have my son found one that he hopes to use to continue its 40-year, hateful crusade against the gospel. What is true here is that I have attacked the big bad wolf. Revealed him and put him in place. That we have is the police who defend than such person, tells everything about them!